359 Coy ASC Group C recruitment is 27 posts. Interested individuals have to submit filled application forms before 21 days from the date of publication of this Chandimandir Contonment recruitment in Employement news. Candidate must have age limit between 18 years to 25 years. Relaxations will be mentioned in the notification. Pay scale for selected candidates is Rs. 5200/- to Rs. 20,200/-. Candidates will be selected based on their performance in Physical Endurance Test, Written test and followed by Practical test held by Indian Ministry. Other information related to eligibility criteria, vacancy details, Pay scale, Age limits, Selection Process, Qualifications, application procedure of Indian Army 359 COY ASC (Sup) Type - G Chandimandir Contonment Recruitment 2017 are mentioned below. Last date to reach application forms: 21 days from the date of notification of this advertisement in Employement News. Advertisement will be given on: 21-10-2017. 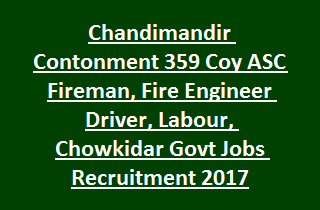 Total no of vacancies in Indian Army Chandimandir Contonment 359 COY ASC Recruitment are 27. 2. Fire Engine Driver: 04 posts. 5. Vehical Mechanic: 01 post. For all post candidates should have age limit between 18 years to 25 years (except for Vehical Mechanic- 18 years to 28 years). Age relaxations for SC/ ST is 05 years and for OBC is 3 years. Labour, Chowkidar: Matriculation pass or equivalent qualification. Fireman: Matriculation pass and must be physically fit. Fire Engine Driver: Matriculation pass and having 3 years driving experience with valid driving license. Indian Ministry will conduct following tests to select candidates for Fireman, Fire Engine Driver, labour and other latest recruitment vacancies. 2. Written test (General Intelligence and Reasoning, Numerical Aptitude, General English and General Awareness). Duration of written test is 2 hrs. Interested Indian Nationals get the application from Indian Ministry official website and submit the applications with all required documents and photographs to the address given in the notification. Last date to receive applications is 21 days from the date of Notification in the employment news. See the notification for detailed application procedure.